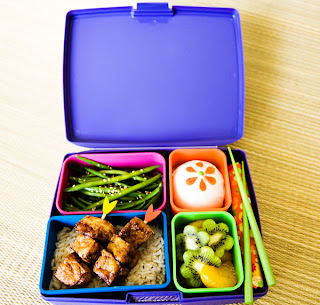 I've been dying to make the fish bento from Hawaii's Bento Box Cookbook. 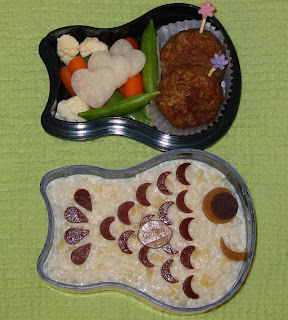 The author filled a fish-shaped bento box with plain white rice and used sliced jumbo black olives to form scales. How brilliant is that? 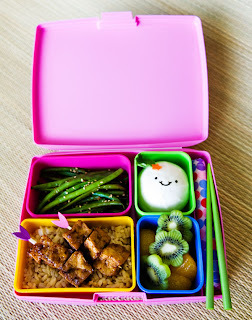 I wasn't able to find a fish-shaped bento box, but I did come across this rabbit-shaped bento box, and saw at once that the pink bunny was perfect for Summershmoo and the shape was close enough to a fish to get the job done. Unfortunately, I was told by her mom that Summershmoo does not like plain rice or olives, so what was I to do? I decided to change the plain rice into a serving of Vegan Glorified Rice, a sweet rice pudding filled with crushed pineapple and silken tofu. Once again I used fruit leather to make the cut-outs. In the upper tier of the bento box I put two vegan sausages, some baby carrots, sugar snap peas, cauliflower florets, and jicama hearts. Verdict: Well, it will be back to peanut butter sammies next time! Even as a sweet pudding Summer did not want to eat rice. It must be the texture she dislikes? She did, however, pick off the fruit leather and eat all the vegetables. She took one bite of the sausage. 5 star cuteness, 2 star consumption. See the wording on the left there, "Vegan gourmet / The perfect picnic"? That's me! I wrote that! I put together a vegan picnic menu for this month's Vegetarian Times magazine. The menu features a roasted red pepper spread sandwich with baked beans, a kid-friendly salad, and coconut cream pies for dessert. 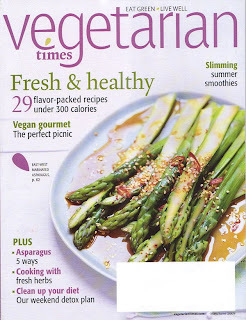 The staff at Vegetarian Times made and tasted each of the recipes and liked them all (whew! ), and I love the pictures they took. Originally my summer picnic menu also included an egg-free, mayo-free vegan potato salad, because what picnic or potluck is complete without potato salad? However, the editors felt that with the sandwiches and beans, the potatoes would make the menu "too starchy", so it got canned. But you're in luck! 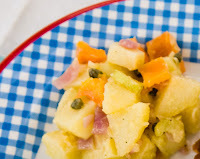 I saved the recipe and am posting my Picnic Potato Salad here. Think of it as a free bonus recipe! Or think of it as the best darn vegan potato salad you'll ever eat. Either way. 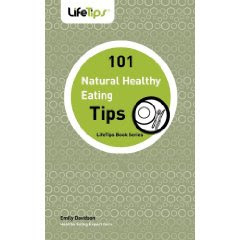 This week Emily Davidson was kind enough to send me a review copy of her new book, 101 Tips: Healthy Eating, Naturally. Emily is described on the cover as a "Healthy Eating Expert Guru" (love it!) She's put her knowledge of natural and holistic nutrition to work creating this little introduction to healthy eating made simple. If you know anyone who has never eaten healthy food before and is looking for a good place to start -- maybe a teen or young adult just getting out on their own, or someone faced with a sudden health scare -- this is a great gift, perhaps tucked into a gift basket with healthy basics or some cooking tools. Topics include basics like how to make a healthy salad, how to survive a trip to a restaurant, understanding ingredient labels, how to steam vegetables and cook grains, and much more. Although the book is not completely vegan, veganism is addressed and topics do include vegan protein sources, dairy and egg substitutes, and appropriate supplements for a veg*an diet. The book ends with a few easy recipes to get the health newbie started, like Roasted Vegetables, Super Oatmeal, and Watercress Stir Fry.